Choose the Right Plan - You CAN Go the Distance! Now that you have set a goal for your marathon, it is time to choose a plan to help you achieve that goal. If you do an Internet search for “marathon training plans,” you will get back hundreds, if not thousands, of search results. There are almost as many training plans to choose from as there are actual marathons to run. My recommendation is that you talk to some of your friends and family members who have run marathons before to find out what they use or recommend. First, they will be using a training plan and schedule that has been proven to be effective. They may actually have different teams and plans based on experience levels, like beginner, intermediate, and advanced. Second, being part of a training team adds to the social and accountability aspects of your training. Running with other people of similar ability simply makes running more fun. Also, by being part of a team, you will have a coach, or team leader, and the other runners to hold you accountable to getting in your training runs. Everyone will ask “did you get in your runs this week?” and knowing that in advance will give you the added motivation to make sure you get out of bed to do the work! An additional benefit to joining a marathon training team is that they will often hold clinics or bring in guest speakers to talk about various topics related to running. They might bring in a local running store owner to talk about the different types of shoes or equipment available, or a Sports Medicine doctor to talk about treating various injuries, etc. This information from experts can really help you with your running. It doesn’t really matter to me which plan you choose, but I absolutely do want you to pick a plan and stay with it. The marathon is your destination. A training plan is your road map. Without a plan, you won’t reach your destination! I’ve used many different plans through the years and have found benefits and drawbacks to each of them. Maybe I’m just hard to please, but I haven’t found just one plan that was right for me. Consequently, I’ve taken pieces and parts from the plans that I’ve used and come up with my own plan. After you’ve run a few marathons, you might do the same thing to suit your particular running needs and style. The “You CAN Go the Distance!” (YCGTD from now on) plan only has three running days per week, whereas most other plans have you running four or five days per week. The three runs are very specific types of runs and you’ll be cross-training or resting between your running days. This plan also has four 20-mile Long Runs in it, whereas some only have one or two. The YCGTD plan is 18 weeks long and all of the runs are based on the Marathon Goal you set in the previous chapter. If you haven’t set your goal yet, go back to that chapter and do it before you start this program. I will explain each of these types of runs in their own chapters. I know you’re excited about getting started, but I highly recommend that you read the next chapter, Build a Strong Foundation, before you begin. 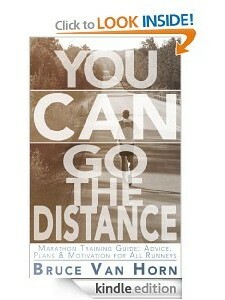 You should also read through the chapter on each specific type of run before you attempt that run. OK, you have a goal and now you have a plan. Let’s get training, using our goal and our plan so that we CAN go the distance!